First Half of the Project: Guest Bathroom | Small, but valuable. While some people struggle with finishing house projects, I really fail with the first step. Today, I sat on the couch for hours while I “worked up the energy” to paint the bathroom. Yup. I don’t struggle to start 20 books at the same time, but starting a house project is too much commitment for me. Fortunately, I made it through the fear of commitment today, and the bathroom has two fresh coats of paint to show for it. Success! But before we get to the fun “after” pictures, I need to let said paint dry and put art on the walls and clean, clean, clean. In the meantime, let me highlight some of the bathroom’s nicest “before” features. That’s the chipped mirror. It shouldn’t bother me, but it looks so sad. Plus, I’m pretty clumsy, so sharp objects anywhere in the house are a danger to my personal health. Time to get rid of that mirror. 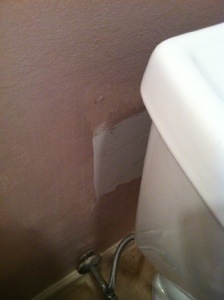 This lovely spot of not paint (below) is my favorite “before” feature. It’s not like it was all that hidden or inconspicuous. I’m unsure what the previous painter was thinking. “Oh, it’s the same shape as the toilet. It’ll blend right in.” Maybe? As you can tell, I had some degree of chuckling disdain for this spot. Until I tried to paint it. I immediately felt less smug and mildly embarrassed/terrified that I would have to leave a white spot behind the toilet, too. I also had a slightly smushed arm covered in paint from trying to reach the spot. But thank goodness, I figured out how to smear fresh paint back there. It wasn’t neat, but it was effective. Whew. I can judge the previous painter again. It was close.